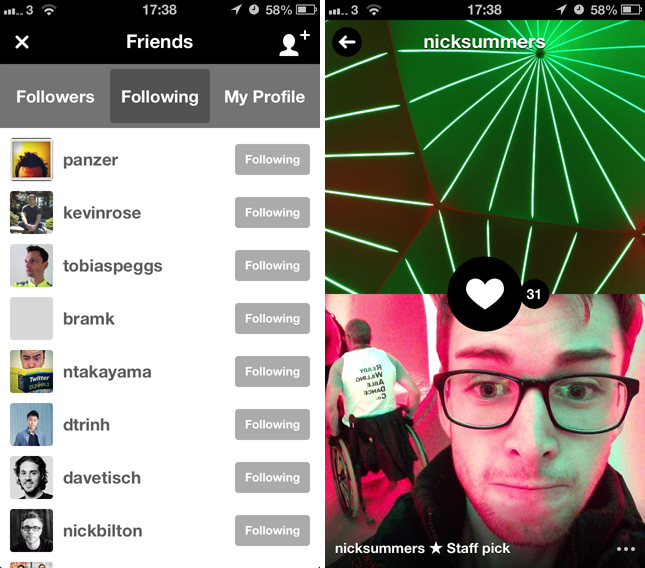 Frontback, the deceptively simple photography app that lets you snap a picture with both the front and rear-facing camera on your iPhone, is being updated today with user profiles and visible following and follower lists. The new features reside in a small, circular icon in the top left-hand corner of the app’s primary photo stream. It’s an invaluable way of rediscovering previous Frontback shots and identifying which uploads have garnered the most likes from other users. Identical to the home screen, users can also swipe up and down at any time to view additional photos. Likewise, whenever you stumble across a standout Frontback image, it’s now possible to jump acress to the user’s profile and view everything that they’ve uploaded recently. You can then add this user to your following list and return to their profile at a later date, slowly creating your own personalized, photo-centric social network. If you’re happy to connect the iOS app with your Twitter, Facebook and Instagram accounts (these are the most popular places to share images anyway), you can also look up which of your friends are already using Frontback and then add them to your following list. It can feel a little primitive, but this is the groundwork for what could be a very special photography app.